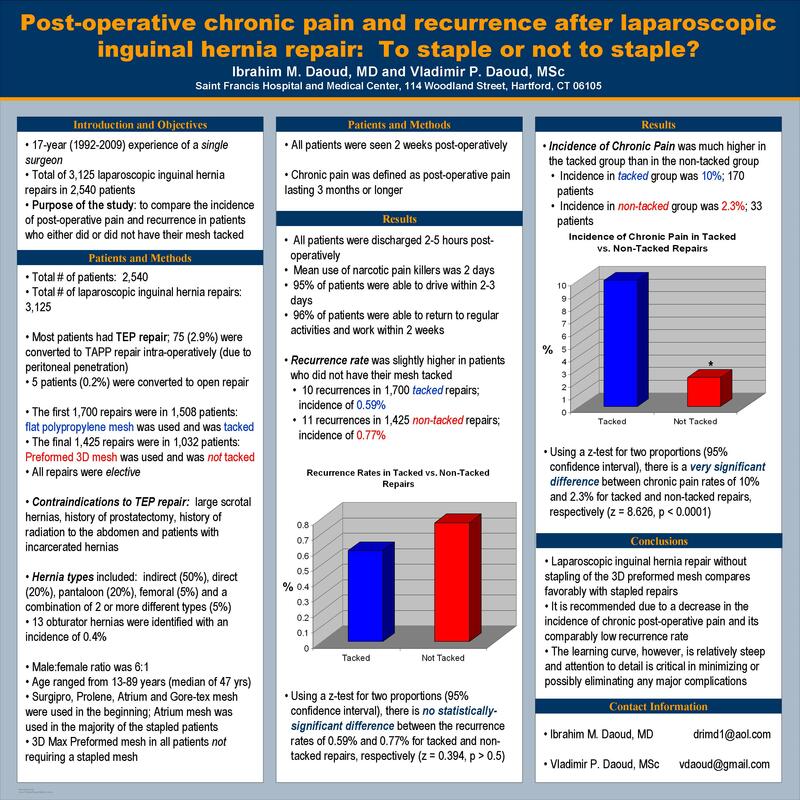 Post-operative Chronic Pain and Recurrence Following Laparoscopic Inguinal Hernia Repair: To Staple or Not to Staple? The purpose of this study was to review the experiences of a single surgeon who, over a 17-year period, performed a total of 3125 laparoscopic inguinal hernia repairs in 2540 patients. In the first 1700 repairs, the mesh was tacked and in the last 1425 repairs, the mesh was not tacked. We then compared the incidence of post-operative pain and recurrence in both groups and found much less pain in the non-tacked patients; however, there was a slight increase in the recurrence rate. Between 1992 and 2009, a total of 3125 laparoscopic inguinal hernia repairs were performed in 2540 patients by a single surgeon at ST Francis Hospital and Medical Center in Hartfod, Connecticut. All patients had TEP (Total Extra-peritoneal) repair and 75 patients were converted to TAPP (Trans Abdominal Pre-Peritoneal) repair; 5 were converted to open repair. In the first 1700 repairs in 1508 patients, a flat mesh was used and it was tacked. In the last 1425 repairs in 1032 patients, a preformed 3D mesh was used and was not tacked. All patients were seen at 2 weeks post-op and the mean use of narcotics was 2 days. Most patients drove within 3 days and returned to work and normal activities in 2 weeks. There was no statistical difference in the 2 groups. However,the recurrence rate was slightly higher in the group that was not tacked. There were 10 recurrences in the first 1700 repairs (5.88% incidence) and 11 recurrences in the last 1425 repairs (7.72% incidence). The incidence of chronic pain lasting 3 months or more was much higher in the first group (10%) than in the second group (2.3%).None of the non-stapled patients had pain beyond 3 months and 2.5 % of the patients who were stapled had pain lasting up to 1 year. In conclusion, laparoscopic inguinal hernia repair without stapling, using a 3D preformed mesh, is recommended due to decreased chronic post-op pain and a low recurrence rate.